Tata Motors has launched the limited edition Nexon Kraz at Rs 7.14 lakh for the petrol and the Rs 8.07 lakh for the diesel version. This has been done to mark the 1st anniversary of the Nexon brand in India. The press release states, "This neo-styling design treatment is inspired from the active world of sports and combined with the athletic performance of NEXON to attract the enthusiastic, active and sporty youth of today." The Tata Nexon limited edition will be available across the company dealerships from today onwards in two variants - Kraz and Kraz+ at a starting price of Rs 7.14 lakh for the petrol model. 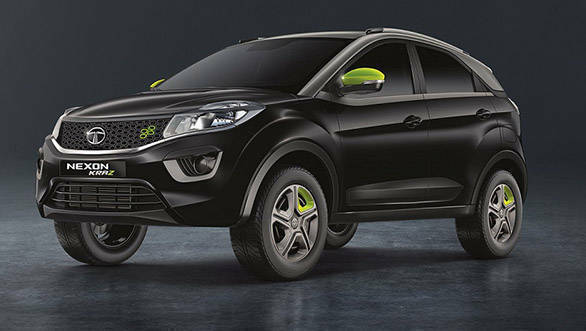 The Tata Nexon Kraz comes with all-new Tromso black shade, neo-green mirrors, front grill inserts, neo-green wheel accent, special edition badging, Neo-green seat stitch with Kraz pattern for seat cushions, piano black dashboard with neo-green air vent surrounds, door and console finishers, steering accents and central control badging. The Tata Nexon Kraz will be powered by the 110PS turbocharged engines  1.5L Revotorq (diesel engine) and 1.2L Revotron (petrol engine) mated with a 6-speed manual transmission. The limited edition Nexon comes equipped with a 4-speaker infotainment by Harman, Bluetooth connectivity and steering mounted controls, automatic climate controls with rear air vents, electrically adjustable and foldable mirrors, reverse parking sensors, a multi-utility glove box and a central console. The Tata Nexon SUV has been recently awarded a four-star rating in the GNCAP crash tests that were conducted under the 2018 #SaferCarsForIndia initiative. The compact SUV achieved the highest adult safety score (13.56/17.00) amongst all the models tested across the Indian market. The test agency states that the Tata Nexon SUV which gets frontal double airbags, frontal double pretensioners, ABS and ISOFIX anchorages, as standard has achieved a strong result of four stars for adult occupant protection and three stars for child occupant protection.